North Seattle College Multipurpose meeting room College Center (CC) 1161. 9600 College Way N, Seattle 98103, SW corner of main campus building with visitor parking in front, just off College Way N (enter NE 95th St). Instead of cleaning up high level nuclear waste, the Federal Energy Department (USDOE) wants to rename (reclassify) it and leave 4% of high level nuclear wastes in Hanford's Single Shell Tanks rather than removing and disposing of it in a deep underground repository. USDOE is taking comment until Sept. 7. Washington Department of Ecology has been invited to share the State's view or concerns. The concern is that High Level Nuclear Waste near the soil surface under asphalt and soil caps or concrete in the bottom of tanks will spread to the groundwater that flows to the Columbia River. At the workshop, we will review this proposal and provide an update on other Hanford issues - such as the spread of Plutonium and what USDOE is planning to do with the collapsed PUREX tunnels. Anyone that eats produce grown in Washington state has eaten food irrigated by the Columbia River at one time or another. 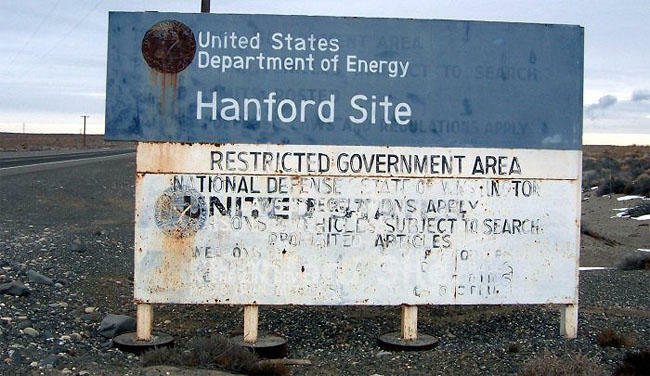 We are all effected by the nuclear waste at Hanford whether we know it or not.